BBT Jap Parts is Newcastle’s longest established Japanese wrecking specialist, and have been in business in Orlando Road Lambton since 1990. 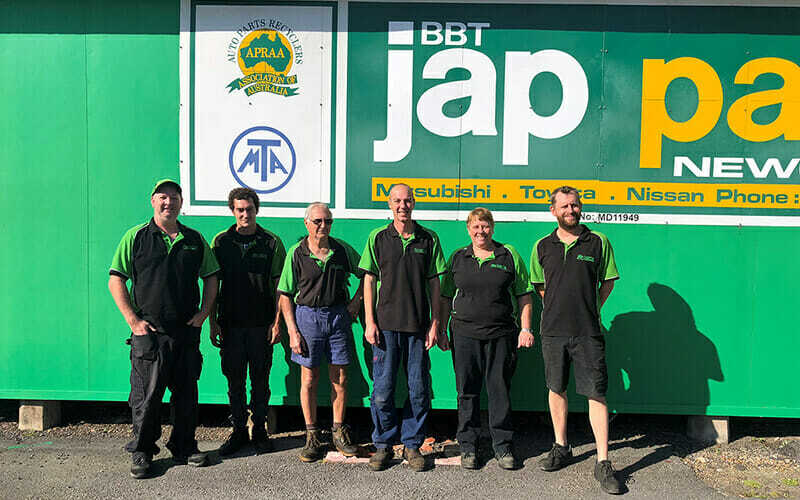 Originally a specialist in Toyota, Nissan and Mitsubishi, BBT Jap Parts is now a dismantler of all makes and models of car, light commercial and 4WD. We stock parts for Toyota, Nissan, Mazda, Hyundai, Honda, Subaru, Ford, Mitsubishi and Kia on site. With a comprehensive stock of recycled, reconditioned and new parts in our computerized inventory, our vehicles are dismantled daily with all parts, cleaned, tested, marked and shelved, together with new after-market products to suit a wide range of makes and models. The friendly staff at BBT Jap Parts can help you quickly with the right part for your needs. We can access those hard to get parts from other dismantlers around Australia through our comprehensive online parts system. Parts are dispatched daily to all regions of Australia via courier companies and Australia post. Let BBT Jap Parts be the solution to your spare parts problem. Contact us today 02 4956 1366 or search our extensive range of parts online using our Online Parts Search.